A colleague had a concern with a Foley catheter. The catheter had drained the bladder but there was a question with the balloon placement. 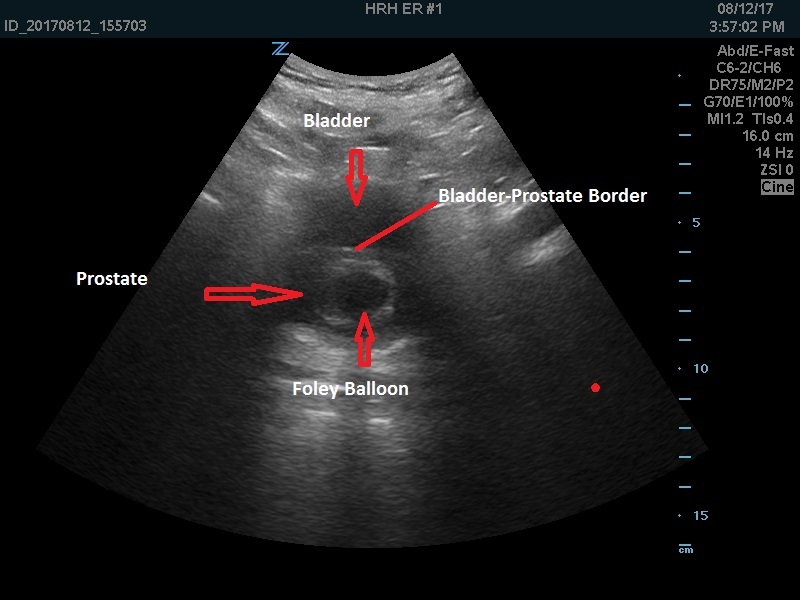 I looked at the bladder which was only 2-3 cm wide, no balloon in sight. I asked him to deflate the balloon and insert the Foley a bit further. The bladder completely collapsed with nothing to see.. Some urine had come out of the Foley. He injected the Foley with water and it filled again to 2-3 cm. When the balloon was filled, I could see the balloon. However it was in the prostate. Deflate the balloon, insert a bit further and the tip of the Foley appeared in the bladder. This time when the balloon was inflated it was clearly surrounded by bladder. The morale: always use POCUS for any problematic Foley insertions. By the way, similar to how nurses have been shown to be able to use POCUS for placing peripheral IVs, Bladder EDE would be really easy for nurses to learn. Hope to see a bunch of you this weekend at WCUME 2017 in Montreal!